I am feeling better and have managed to stay well for almost a month now *gasp*. Please pray for me that I don't get something again. I don't think my feeble body can handle it. Only 3 1/2 months left to go until new baby and I'm getting very large. I can DO IT! So I should be able to update the blog more frequently now that I'm well. I just had a birthday and I used some of my money on a new video doorbell (adulting!) and....Barbie shelves for the office! First order of business on the new shelves, getting all the holiday dolls displayed. And another shelf on the adjacent wall. There was also space to put some of my favorites. All have been featured on this blog! I especially love the I Love Lucy candy factory one. And some next to my Ever After High Dolls. A couple of these were on the shelves before such as Ice Cream Romper and Halloween Barbie and Kelly. And one more addition that I just HAD to bring out. I couldn't leave her packed away. There was not room on the shelf so she is here for now. This weekend I got a new addition, a birthday present from my dad. This is the 2003 DC Comics Barbie as Batgirl doll! She does not have a serious face but her typical smile. I think it makes for a very cute doll. She comes with a keychain box for you and holds a bat in her gloved hand. She also comes with a stand and she wears yellow boots. The back of the box has an illustrated version of Batgirl and other characters in the series like Wonder Woman and Super Girl. And the last doll I am featuring today is one from my collection that I've had since I was a little girl. This a beautiful Sandy doll called "Magic Moments." I featured her before in a very very brief post. But in those pictures I left her in the box and she had a teardrop missing form her left earring. Pictures from inside the box when she has been opened? What's up with that? Let's use some deboxed pictures! I have always loved her face and jewelry. But her dress is absolutely to die for! Long waisted with a ruffle at the top. ANd the black and stars? Love! Also, that long long hair. So awesome! Well, that's all for today. Do you have BatGirl or any Sandi dolls in your collection? Let me know in the comments below! 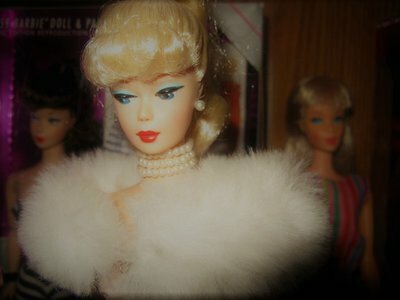 I'm going to work on the cleaning of the vintage dolls so I'll have those results for my next post. Until then! I hope my doll room can look that nice someday! Hang in there and stay well! Wow, the display looks Awesome (with a capital A :-D)! Batgirl is just wonderful, I have never seen her before. That bat is so cool, and the gloves too. Take good care of yourself with plenty of rest! Oh and I forgot: Happy Birthday!!! I love your doll room. I am still working on my doll room. It is my office and sewing room as well and finding spots that are4 perfect for things is... not easy! Happy birthday and hang in there! The display looks great! Happy belated birthday, Teresa. Your doll shelves look great. Hang in there and keep well. I had some occasional Sandi dolls in lots, but unfortunately their hair was a hot mess. I'm amazed at how good you kept the hair on your Sandi. Thanks RagingMoon! It's been a long time coming! I'm so excited! Hi Mel! You'll get there someday for sure! It does take some arranging and rearranging (and rearranging again!) It was hard when I was in our other house, all I had was a small bookcase. :) But it's fun to get them out and play during the rearraning, that's what I did, lol. Thanks BlackKitty! I still can't believe I have them all out after years and years! Hi Andrea! Thank you! Sandi's house was always her black box, that was the major factor to keeping her hair in awesome shape. I have another Sandi doll that I played and played with and her hair is definitely frizzy. Totsy didn't have as high of quality hair as Mattel but maybe there is some hope for her. If not, she could be a great candidate for my first reroot! I hope you're still doing well! I had a terribly painful double ear infection when I was pregnant with my youngest. It hurt so badly that the doctor gave me Tylenol with codeine... only I didn't know that I was allergic to codeine. More sickness followed. It's so great to have our dolls out on display, isn't it? My next goal is to get shelves with glass, so that they get less dusty. But in the meantime, I still like to see them out. Hi there, I love that your birthday is October... I live barbies and was so busy adulting, that I forgot for 40 years! Fun to see all the other adults having fun with barbie too! Happy Halloween from Barbie and Kelly!